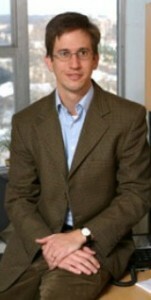 Santiago Schnell’s lab combines chemical kinetics, molecular modeling, biochemical measurements and computational modeling to build a comprehensive understanding of proteostasis and protein forlding diseases. They also investigate other complex physiological systems comprising many interacting components, where modeling and theory may aid in the identification of the key mechanisms underlying the behavior of the system as a whole. 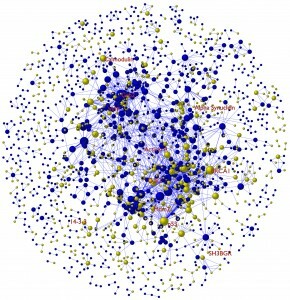 Representation of the human protein-protein interaction network showing disordered (yellow) and ordered (blue) proteins.